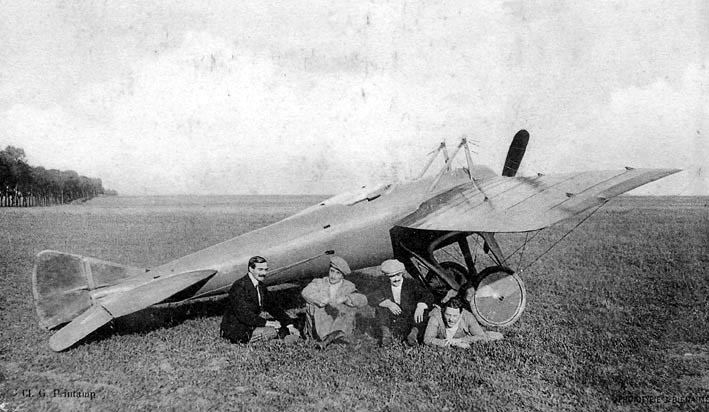 1912 – Jules Vedrines wins the Gordon Bennett Trophy by flying a world-record speed of 108 mph in his Monocoque Deperdussin monoplane (shown with crew) at Chicago, Ill.
1929 – First flight of the de Havilland DH.80A Puss Moth, a British three-seater high-wing monoplane. 1973 – Death of Sergei Konstantinovich Tumansky, Soviet aircraft engine designer. 1977 – Maxie Anderson, Ben Abruzzo, and Ed Yost depart Marshfield, Mass., in the balloon “Double Eagle” in an attempt to make the first crossing of the Atlantic Ocean in a balloon. 1983 – Birth of Deanna Marie “Dee” Brasseur, Canadian military officer and one of the first female McDonnell Douglas CF-18 Hornet pilots in the world. 2009 – Aeroméxico Flight 576, a Boeing 737-800 with 104 passengers aboard, is hijacked while flying from Cancún to Mexico City; after landing at Mexico City International Airport, Mexican officials storm the plane and take five men into custody. No injuries are reported.